Vince Mendoza has been at the forefront of the jazz and contemporary music scene as a composer, conductor and recording artist for the last 20 years. 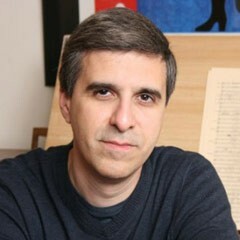 Vince Mendoza has been at the forefront of the Jazz and contemporary music scene as a composer, conductor and recording artist for the last 20 years. According to All About Jazz Mendoza “daringly expands the vernacular by including elements of abstract impressionism, romanticism and a highly unorthodox palette to position him as the clear and natural successor to the late Gil Evans.” He has written scores of compositions and arrangements for big band, extended compositions for chamber and symphonic settings while his jazz composing credits read like a “who’s who” of the best modern instrumentalists and singers in the world today. Mendoza was recognized as ‘Best Composer/Arranger’ by Swing Journal‘s critics poll in Japan. His CD “Epiphany” features his compositions played by the London Symphony Orchestra. “El Viento” and “Jazzpaña” further pushed the boundaries of Jazz and Flamenco Music. His 2011 solo release “Nights on Earth” features Mendoza compositions arranged for small and large ensembles, with guest appearances by Luciana Souza, Malian vocalist Tom Diakite, and musicians from Spain, Africa, and Brazil. Mendoza’s most recent release “Homecoming” celebrates his new compositions for the WDR big band in Koln, Germany. Mendoza’s arranging has appeared on many critically acclaimed projects that include dozens of albums with song writing legends such as Björk, Chaka Khan, Al Jarreau, Bobby McFerrin, Diana Krall, Melody Gardot, Sting and Joni Mitchell. He has 6 Grammy awards and 29 nominations. Mendoza has also written commissioned compositions and arrangements for the Turtle Island String Quartet, the Chicago Symphony, the Los Angeles Guitar Quartet, the Metropole Orchestra, the Berlin Philharmonic, the Hollywood Bowl, West Deutsche Rundfunk, the Czech National Symphony and the BBC. His music was featured at the Berlin Jazz Festival. He has performed at the Monterey, Montreux and North Sea Jazz Festivals.